Another Run for the Luck of It is here and gone. Just like the 1st place winner that whizzed across the finish line in a blur, the day of the event snuck up on us and was gone in a flash. A flash of over 700 PEOPLE!! 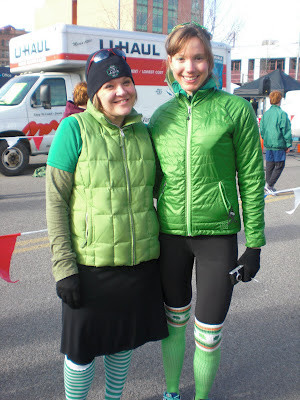 For anyone that might not know, my superstar friend Jen and I co-direct a St. Patrick's Day foot race. The race is in its 3rd year and the first two years the event was just a 5k fun run. This year we also added a (lucky) 7 mile distance which attracted 200 more people than last year. What a success! In any event of this size, there are going to be a few hitches. But the hitches were minor and the day was glorious! The sun was shining, the participants were dressed in their finest St. Patrick's Day garb, the bag pipers were kilted and played jovially throughout the morning. Yup. We were blessed with a plethora of rock star volunteers. Over 60 people dedicated their morning, their hearts and their voices to our event. We never ever in a million years would have been able to pull this off without them. Simply stated: they made this day what it was! And our husbands....oh, did they work hard. They spray chalked, duct taped and marked the heck out of the courses. In the dark. For hours. There is a 0% chance that Jen and I would have had time to do this, so without them there wouldn't have been a race at all. Or maybe it just would have been a mob of crazy green chaos running blindly through Missoula. Either way, they paved an easy way for the runners to follow. When the runners returned to the staging area they gorged themselves on corn-beef stew, soda bread and beer. Because, seriously, who doesn't want to drink a beer at 10:00 am? We went through 3 kegs, so I guess that answers that question. Anna even made an appearance toting my mother & father-in-law along with her, and crossed the finish line in record time. Go Anna! My in-laws hung with Anna for two days and made it possible for Mace and I to run around like crazy people and get everything done. 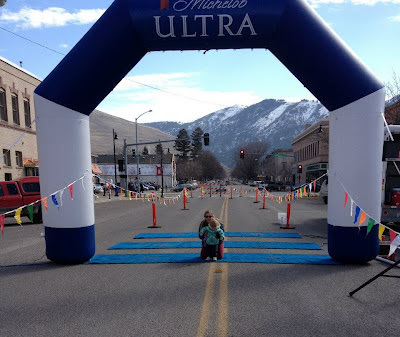 If you want to see more awesome photos of the day check out Run Wild Missoula's Facebook page. Oh what a day! Oh what a day. A huge shout-out to Jen, to our awesome hubbies, my in-laws and everyone that made this day what it was. Thank you everyone for your cheers, your love and your patience while I dropped off the planet for a couple of weeks. It takes a village...yes it does. And now, I am collapsing for a day or two to get my head on straight. So cool of you to sponsor such a wonderful event. 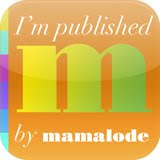 I know it is not an easy task and kudos to you for doing this each year! Glad to see it was a success, which I am sure it will continue to be every year! I LOVE the dudes in their crazy outfits! Way to go organizing this thing!!! Woot woot! Sounds like your run was awesome! I love all those green get-ups :) Congratulations! You are amazing to organize such a big event! Looks like a fun day! Glad it went well for you! Good to have you back--glad the event went so well! That's amazing, Maggie! You look adorable! Congrats on your success! Hugs!